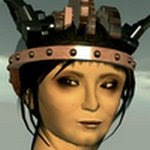 Second Life has been used before as a platform to create Real Life art anew, as can be seen in AM Radio's magnificent Death of Marat, portrayed here on Hamlet Au's New World Notes, and of course, in Robbie Dingo's absolutely unforgettable recreation and video of van Gogh's The Starry Night, among others. 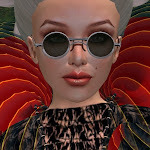 What interests me especially about Swede Keiko Morigi's (she goes by the name [enter name here] on Flickr) (rez: 3/1/2007) recent work is that she sets up and photographs the recreation within Second Life, which, in her words "did look pretty crappy inworld... LOL... but ta-da... gotta love PS!" She is referring to Photoshop, of course... and her approach, which obviously met with much success here, is yet another way that Second Life can serve as a foundation for creating art. Keiko Morigi's "Baglione," made possible with the participation of friends and models (and significant photographers themselves) Khamudy Mannonen and Raul Crimson. 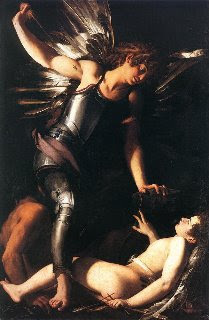 In 1602, early baroque painter, author and Roman Giovanni Baglione created Heavenly love conquering earthly love, a favorite example of art historians to demonstrate the Chiaroscuro technique that was very much in vogue at the time, which focused on contrasting light and shadows softly to highlight and add volume to three-dimensional images. This is a great creation from Keiko, I like that she has not just copied the original but put her own slant on it. A couple of other folks that have recreated classic paintings are Parrish Kline and Khamudy Mannonen. I have known Keiko since her first postings upon flickr... never have I met another soul who's richness in friendship is the only thing that supersedes her artwork. This woman is brilliant...her imagination, her creativity, her beauty and depth of her images...be they dark and tortured, or light and commical...there is something deeper in which we all find a piece of ourselves within each image. I love the works and the person behind them. I'm overbearingly curious how these incredible people get such an incredible end result out of an SL photo.... I'm a PS artist and I can't even figure it out!